To help find a cure for breast cancer, dedicated packages of Fruit Punch flavor Sport Beans® jelly beans by Jelly Belly will benefit The Breast Cancer Research Foundation®. The campaign moves into its sixth year and has helped raise funds for research. Since the program began in 2007 Jelly Belly Candy Company has donated nearly $115,000 to The Breast Cancer Research Foundation. "While October is Breast Cancer Awareness month, sales from our program contribute to the foundation year-round," said Rob Swaigen, vice president of marketing for Jelly Belly Candy Company. "We are proud to support the cause to end breast cancer and are happy to extend our program for another year." The Sport Beans "pink ribbon" packaging includes a pledge to donate 5% of the sales of Sport Beans Energizing Jelly Beans® up to $40,000 annually to the non-profit group. Sport Beans jelly beans are formulated for sports performance and contain 25 grams of carbohydrates, as well as electrolytes and vitamins. Fruit Punch Sport Beans are gluten free and made with color derived from grape skins. The pink ribbon Sport Beans packages are available in 1-oz. single serving bags, 100 calories per bag. Additional information is available from Jelly Belly Customer Service at (800) 522-3267. Jelly Belly Candy Company introduced Sport Beans jelly beans in 2005. Scientifically formulated for sports performance, the energy product helps maintain hydration and replenish nutrients. 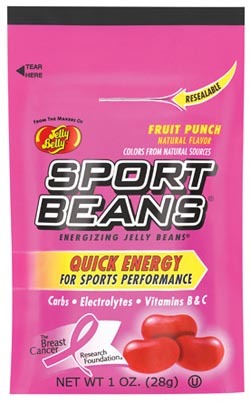 Visit us online at www.SportBeans.com and www.Facebook.com/SportBeansUSA.